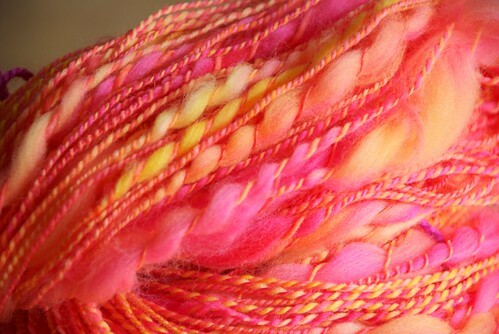 Spinning novelty yarns is challenging. I know that when people start spinning, it's really common for someone to say, "Wow! Your first time and you're spinning novelty yarn already!" I picked up the Sit and Spin DVD last year, and co-erced a friend (and the podcast intern) into giving novelty yarns a spin. The intern (K, the Wünderteen) was stellar at it. British Mary and I were... not so much. 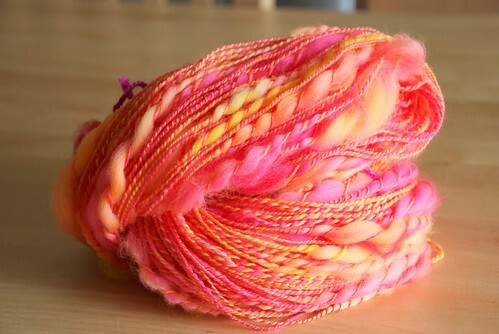 So, when Kevin over at HansenCrafts sent me a MiniSpinner to review, I spun sock yarn on it. I spun woolen fluffy yarn on it. I spun coils on it. I didn't say that they were *good* coils. I'll be the first to admit, they're not amazing. Or created evenly. But I did it. It was challenging to do. Based on the numbness in my lip afterward, I had my "concentrating" face on the whole time. You know what coils are? Fun. How could you look at this and NOT want to [at least] try it? Shame on you for not labeling your stuff, Mystery Etsy dyer! NO SOUP FOR YOU! In any case, while my next coils might be less epic, I will love them just the same. I'll just have to wait until I get a MiniSpinner of My Very Own, since the review one is going back to Kevin this week. Also, for those of you in the Blizzard-y states? I hope the groundhog declares Winter over. I also hope he's wearing day-glo, otherwise you might miss him. I like the color. Nice and bright! Is there any other DVD like this to be found as it seems so fun trying to spin these. In many countries in Europe her tatoos are not acceptable and signals prison, for a woman also other "occupations". I really wish she could have covered her arms.